As many of you may recall, recently I’ve located 3 fishmongers in my part of town. This was quite the lucky stroke, especially considering that for years now, only previously frozen fish was available to me — unless I wished to pre-order what I wanted. Yes, that was a possibility but there was little room for spontaneity. Living by myself, I don’t mind planning a dinner when guests are involved but when dining alone, I’ll often let the market decide what I’ll be preparing. Very often that meant that good, fresh fish were off the menu. Well, not anymore. Now that I’ve a steady supply of quality fish, I’ve certainly taken advantage. Branzino, sturgeon, merluzzo, salmon, shark, and sea bream have all found there way to my table, as have more clams than I’ve had in the past decade. I’ve prepared the fish in parchment (al cartoccio), grilled (alla griglia); baked (al forno), stewed (in umido) or, like today, pan-seared. None is difficult or complicated to prepare, nor are any so bone-riddled as to be unpalatable. Although 1 specific dish may give you pause, I guarantee that you will be able to prepare the others without so much as batting an eye. So, with Christmas Eve approaching fast, I plan to present 3 fish dishes to you in December. Today’s recipe is Pan-Seared Salmon Fillets. This is so easy to prepare that I debated blogging about it at all. Still, I was motivated to do so for the benefit of the younger members of my family. Preparing fish can be a bit daunting for the inexperienced cook and a recipe like today’s is a confidence builder. With both the salmon and sauce taking less than 15 minutes to prepare, all you have to worry about is preparing a salad and whatever sides you prefer. The only way this meal could be easier is if you ordered it in a restaurant — and then it would cost you at least double. Combine yogurt, dill, and garlic into a small bowl and mix well. Season with salt & pepper and set aside. Heat a few tablespoons of olive oil in a medium skillet over a med-high heat. Season both sides of the salmon with salt & pepper. When oil is hot, add the salmon fillets, skin side down. Turn fish over once skin is well-browned & crispy but not burnt. This should take 4 to 5 minutes. Continue to sear, flesh-side down, for about another 3 minutes. This will give you a fillet that is med-rare to medium internally. Cook more or less depending upon your own preferences. Serve immediately garnished with chopped dill and accompanied with dill sauce and lemon wedges. To insure that the salmon cooks evenly, select yours from the thickest part of the salmon fillet. If you must use the “tapered end” of the fillet, you will need to adjust your cooking times accordingly and the salmon skin may not fully crisp. Although the dill sauce may be prepared and served immediately, it is best when prepared a few hours in advance and allowed to sit so the flavors meld together. I prefer to serve it at room temperature and will allow it to sit on a counter for about an hour before serving. 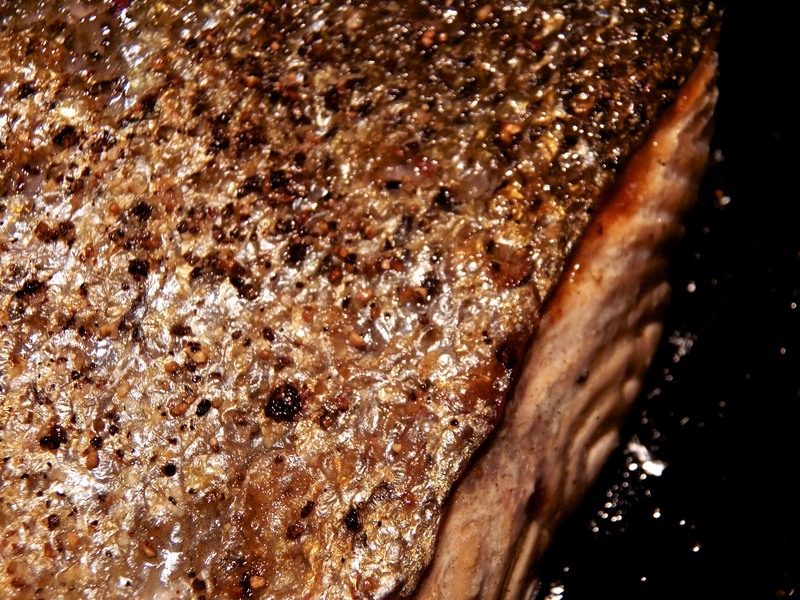 There are definitely 2 schools of thought when it comes to eating the skin of cooked fish. This recipe specifically crisps the skin. If you enjoy eating crispy skin, serve the fillets skin-side up. If you prefer not to eat the skin, serve the fillets skin-side down. This will soften the skin and make it easier to avoid while dining. With an eye towards Christmas Eve, I thought today’s Blast from the Past should follow this month’s fish theme. In many Italian households, baccalà (salted cod) is the centerpiece of the Christmas Eve dinner. Click HERE to learn how my family prepares this dish. This entry was posted in Seafood (Frutti di Mare), Vegetarian and tagged Cooking, Food, Italian, Recipes, Seafood by ChgoJohn. Bookmark the permalink. Holy fishing rods!! That looks so delicious. Our dinner last night was something similar to this and nothing was left over…everyone loved it! Good quality fish makes a wonderful meal and doesn’t require a great deal of preparation. Sometimes simple is best. Thanks, Stefan. I’m not so much promoting fish as I am celebrating my good fortune. I really cannot wait to see how each fishmonger’s “inventory” changes with the Seasons. So far, it’s been wonderful! ooooo CHRISTmas Eve!! I cn’t wait, I love seafood, all kinds…can’t wait to make the calamari ala John! Hey, Maria! You will love Mom’s calamari salad. It is so easy to assemble, the colors so bright, and the flavors so fresh. She really hit this one our of the park. I’m toying with the idea of making it with octopus this year. We’ll see. You are so kind, Mandy. Thank you. What I like about this dish is that even on those nights I don’t feel like cooking, I can have this fish prepared and on the table in 15 minutes. A few minutes more and the sides are ready, too. It sure beats a sack o’ food from some take away. LOVE the crispy skin – salmon bacon…… lovley dish and perfect for guests or a party…. I’m with ya, David. I was surprised that I had no photos of a serving with the crispy skin on top. In our poor afternoon light, none were publishable. And you’re right. This dish comes together so quickly that it is perfect for dinner guests. This is a beautiful piece of salmon. Your instructions couldn’t be more easy. I’am the only one in my house who loves salmon, shame on them. I will enjoy this with the sauce until my hearts content. Glad you blogged, because simple is always welcome at our table.. I also sometimes debate whether a dish is “bloggable” if it doesn’t require elaborate preparation, but the truth is lots of people have little time and energy to devote to cooking, especially on weeknights. Thanks, Sally. That is always the question, whether to post the simplest of recipes. I think back to when I first started cooking for myself and how many meals I ruined, not knowing how to prepare some part of it. Do that with a piece of fresh salmon and that could be a costly mistake. Hopefully, I can help the young cooks in my family avoid that problem. Thanks, it’s a great way to cook salmon. Asians love crispy salmon skin, so definitely serving skin-side up. Simple treatment is the best when using quality ingredients. This is my kind of cooking, thanks for sharing. Dumb question, how long can you keep baccala (uncooked and dry) in the fridge? Baccalà now 2 ways. You can get it dried and it doesn’t need refrigeration. That kind will last indefinitely but there’s no need to keep it that long nowadays. I don’t think that the refrigerated version will keep as long but it will certainly keep for a few months. No matter which kind you buy, make sure you keep it free of moisture. Be especially careful in the fridge. Double-bagging will help. I really have never had a problem with spoilage because I use us it shortly after purchasing it. I have 3 or 4 sources for baccalà so there’s really no need for me to buy it when I see it and store it until I use it. Thanks, John, I see it at one of our supermarket this time of year, sitting out in a wooden crate, is this the dried form? Is the refrigerated variety kept in the fish case. In my markets, the dry baccalà is stacked on a wooden shelf near the fresh fish counter. The refrigerated is in a case near the fish counter but not with the fresh fish. It’s where the market has smoked fish, herring, and the like. Both are packed in salt but the dry one is much more stiff. If you ask the fishmonger working the fish counter, he’ll direct you to the baccalà, without a doubt. And I’m here if you’ve any questions. Good luck. Thanks John, now I know the difference. Glad to be of help, Norma. Anytime. I used to tell customers that the secret to making good seafood at home was twofold: Buy good fish, Don’t screw it up…the simpler, the better when you’re learning to cook it. This definitely qualifies! Not having much luck getting the Angel to eat fish, outside of crabcakes and salmon cakes…we’ll keep trying, though! I would have loved to see you behind that counter, Marie. I would have gladly waited for you to serve me just so I could watch you advise your customers in the meantime. Priceless! Yes!!!!!!!!!!!! Yummy yum yum. Thank you for this recipe! Glad you found some good fishmongers. Fish is great tasting, easy to prepare, and good for you. 🙂 Love the simplicity of the dish and dill goes so well with salmon. Nicely done, John. Thanks, Richard. These last couple months have been heaven-sent. It’s nice knowing that I’ve got a steady selection of fish, all fresh, other than pre-frozen salmon or tilapia. I just adooooore salmon. We eat it very often in my home, so delicious and healthy! The dill sauce sounds delicious for the salmon! P.S. the photo of the pasta with the burrata is mouthwatering. I mean, a few things are more delicious than a burrata.. Thanks, Villy. Salmon is a favorite of mine, too, and this is such an easy way to prepare it. So quick! ” … effortless fish dinner …” Now where was that phrase when I was trying to write this post? When the ingredients are fresh and of good quality, there’s really no need for embellishments. Less is best. Just keep rubbing those fishmongers in will ya? 🙂 And while you’re at it, I want to keep hearing more about how fresh fish, like this beautiful salmon, is readily available! 🙂 Oh how I miss good seafood! Yes, this is a simple recipe, but John – you did it justice. I’m now craving salmon with dill sauce!!!! I’ll be thinking about this all day. Oh, MJ. Up until a few months ago, I was in the same boat as you are now. Fish for dinner meant defrosting something. This is such a wonderful turn of events! My luck changed and I hope yours will, too. Salmon is really one of our staple fish and we love it! Although, to be a bit healthier, we always remove the skin after cooking; I haven’t been able to stomach eating the skin for years, no matter how crispy. I love the dill sauce with the salmon, and room temperature is perfect so it doesn’t cool down the main attraction. JT and I are doing a whole smoked salmon this Saturday, so I’ll be using your dill sauce for sure, it’ll be a perfect accompaniment particularly with the Rosti potatoes we plan to serve with it. My mouth is watering just thinking about the salmon with dill sauce. My Mom used to make herself a fish for Christmas Eve, now that brought back some fond memories, thank you. Thank you, Eva. Your smoked salmon has my mouth watering. Freshly smoked salmon is such a delicious dish. You guys are really serving a feast this Saturday. Buon appetito. Salmon is actually a great recipe to post — it’s a fish that most people like, and it’s one of the more available fresh fish. Heck, most supermarkets carry it (although I’m not sure how fresh it is; I never buy it there!). When I panfry my salmon I make it just like you do! Although sometimes after I turn the fish, I’ll stick the skillet in a 300 degree F oven to finish. If I do that, I’ll sometimes splash in a bit of wine and cover, so the fish both bakes and steams. That’s one of the things I really enjoy about cooking fish — you can use so many different methods and get excellent results. Really looking forward to seeing your other fish dishes this month. Thanks, John. I, too, have finished fish fillets in the oven. Today’s preparation is just about the easiest I could think of and perfect for the young cooks in my family. Hopefully, it will embolden them to try their own hand at pan-searing some salmon. And you’re right. There are many great ways to prepare fish and most do not require a great number of ingredients. We are so in agreement. Less is best when the ingredients are fresh. John, are we related? We seems to be cooking almost the same dishes, and use specific ingredients to prepare it. It gives me goose bums, really… 🙂 I am such a big fish eater, I don’t eat too much meat, but fish keeps me from becoming a vegetarian (I did try, it didn’t work that well: my cravings for fish was too strong, and I also limited myself from trying a really good regional foods) 🙂 Sometimes I come here and feel as I enter my mother’s or grandmother’s kitchen: flavors don’t lie. That’s a high compliment, Marina. Thank you so much. There are a few of us that, when family recipes are posted, I often think immediately of Mom in the kitchen. Yours are definitely in that group. It’s amazing, when I think of it, and so unexpected. It’s a wonderful benefit of blogging. Where do you buy baccala? Is there an on-line store you can suggest? I buy it at an Italian market and at a Greek market, Marina. Both are salted but the Greek market’s cod must be kept refrigerated. I know that bacalao is prepared by the Spanish and Latinos, too. Although I’ve never looked, I bet it could be found in their larger markets, too. I’ve never bought baccalà online and never even considered it until you mentioned the possibility. I just checked Amazon and they do have it for sale in their Grocery section. I’ve no idea of its quality and it does seem a bit expensive, especially when you add shipping charges. Baccalà is traditionally served in Italian households on Christmas Eve, so, this would be the time to find it at an ethnic market. I wish I could be of more help for you but I just don’t have any experience ordering it online. Sorry, Marina. Good luck! Thank you John. That is even more information than I expected. I’ll check our Mexican stores, good idea. I think I’ve seen it there. Need to have one for Christmas. I ordered Bottarga from Amazon, it was very good. I am sure baccala is also of a good quality. Rather than drool all over my monitor at these photos, and this recipe….I think it’s best if I just go pout in the corner because I don’t have ANY access to fresh fish here. None….zip…..nada…..and all of a sudden, that feels a whole lot more wrong than ever before. What a fantastic dish, John! You have got yourself a deal, sir. Thank you so much! Oh how I’d love some fresh fish around here. I hope this inspires them, too. I spoke with one at Zia’s birthday party and he’s been trying a few of the recipes — and is happy with the results. It was that conversation that convinced me to post the recipe. Thank you, Judy, for your words of encouragement. You know me – simple is best, especially when the ingredients are good. And the way you eplain it is perfect for anyone a little nervous of cooking fish. Roll on Christmas Eve! Salmon is one of my favorites and I’m lucky my kids like it too! Love the Greek yogurt in the dill sauce! Alas, I have no fishmonger, just the grocery store. I envy your supply! Thanks, Tanya, and I know where you’re coming from. It was only recently that I found these fishmongers and I’ve not bought a thing from my grocer’s fish counter/freezer since. It’s been very nice, to be sure. Glad you found some fresh fish & this salmon looks wonderful. Salmon is probably one of my favorites because it goes well with a light sauce but can handle something with a little more zing to it like dijon mustard too. I was just commented to someone on another blog about how we’re so lucky to live in New England where fresh fish is taken for granted although I haven’t heard of a couple you mentioned – murlozzo & sea bream. I love how easy this topping sounds & will have to give it a try on the next salmon that lands here. Thanks, Diane. You New Englanders, as well as anyone along the coasts, have it really good when it comes to seafood. We’re a good 1000 miles from the nearest coast. Most of our fish is shipped to us frozen. The fish sold by these fishmongers may cost a bit more but they’ve never been frozen, It’s a real treat!Like you, I enjoy salmon because it is such a meaty fish and can handle more than some lemon and butter. You come up with this on the spur of the moment? Well, we’ll just give you no notice if we’re ever in Chicago then. Although, your pasta…. hmmm. Decisions, decisions…. Having just learned that a highly respected chef known worldwide has lent his name to a series of crumbed frozen fish fingers, fillets and balls in NZ, it is such a joy to look at what you are cooking and HOW! Use all your methods with love 🙂 ! Love the dill sauce and can’t wait to get my mitts on your squid/octopus salad: could we possibly have a recipe ere Yule? Am truly touched: have already looked up and love its simplicity – will put it on the Yule menus – thank you 😀 ! I always make squid and cuttlefish by the ‘barely cooked’ method; octopus often gets prepared ‘the Greek way’ in fragrant tomato sauce, and that I’ll slowly simmer for quite awhile!! It’s not at all a problem, Eha. In fact, I’m pleased you’re considering serving it during the holidays. This blog was started to preserve my family’s recipes. Well, they’re no good being preserved if no one uses them. I get a smile every time someone writes to say they’ve tried one of the old recipes. Mom’s smiling, too. Thanks for making my night. Thanks, Judy, for leaving such a nice compliment. The ponytails actually really like fish, so I love to prepare it because it is quick and healthy and you’ve pointed out. This recipe looks great, as does your family’s salted cod dish, which I’m dying to make now! I just baked salmon filets Saturday night for an engagement dinner. Used parchment paper so the skin didn’t stick and they were delicious. I wish I had your dill sauce recipe! Your photo is enticing and I realize I didn’t photograph any dishes from my dinner. Don’t know Burrata cheese yet but look forward to the next feature. How it got to be time to think about Christmas Eve dinner is beyond me. I almost always ask for salmon when we are out to a nice restaurant. I enjoy it very much, but except for a few rare instances I don’t cook it myself. I don’t think I have the knack for figuring out when it’s done. I don’t like it too rare and then to avoid that, I overcook it. You’ve given me a new chance to think about it, though, and I love the dill sauce. I’ll have to try again! It looks so good! Do give it another try, Debra. I know to flip a salmon fillet after 4 and a half minutes. And that’s because I’ve cooked it enough times to know how high to have the flame and how hot to have the pan. Only by doing will you learn that. Believe me, it isn’t hard. One thing Emeril taught me years ago is that if you see “white juices” coagulating on the side of your salmon, that’s a sign that it’s being over-cooked. Get it out of the pan ASAP and you’ll have a fillet that’s just about medium. Chef’s like their fish rare. So, once you’ve flipped the fillet, start watching it closely after about 2 minutes. Keep track of the time and use the appearance of the white “stuff” as your guide. If the fillet is too done, next time pull the fish a minute sooner. In one or two cooking attempts, you’ll have learned how to cook salmon just the way you like it. Promise! You shouldn’t have to wait until a night out to enjoy salmon! Good luck! I LOVE the combination of dill and yogurt! Sometimes when I’m in a bingey mood I’ll just eat a dill dip minus the chips. I don’t know why; but for some reason in Kerala we are always told never to combine yogurt and fish- I’ve heard this from both my grandmothers and a great-grandmom over and over; yet there are so many recipes where the two complement each other. This one is a winner! I’m glad you enjoyed the post and took the time to comment. Oh, just looking at the salmon with dill sauce made my mouth water. I can’t wait to get settled and have a REAL meal! Your salmon and sauce will be high on my list! I’m not much of a fish/seafood person, but my husband will LOVE this! How exciting to have three fishmongers to choose from. Looking forward to the other fish dishes too. I’m so glad that you now have a source for fresh seafood…there is nothing better. 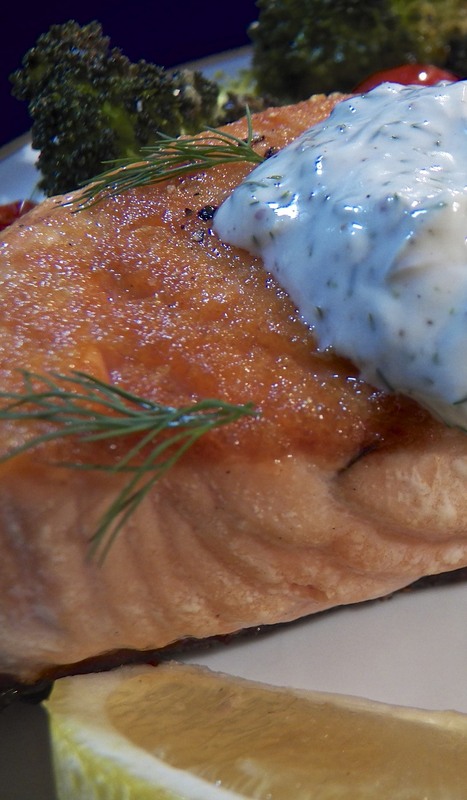 Your dish looks terrific…dill sauce is perfect with salmon. That dill sauce looks glorious on that mouthwatering salmon!! I love dill (aneto in Italian) and you just reminded me how well it goes with salmon! I will definitely try this one out!! Thank you, Ambrosiana! Salmon and dill are a match made in heaven, aren’t they? And as you saw, this dish is quite simple and easy to prepare. It really makes a great meal. I love salmon! Up until now, I had no idea what to do with it other than make it with teriyaki sauce. Thanks for sharing another option! Looks exactly like what Liz and I prepare and I’m sure it was just as delish. Next step…cure that salmon man! And stop bragging about having three fish mongers…at least until I find a good in DC (where we finally found a place to live!). Really glad to hear that you’ve found a home. Sounds like Santa came early this year, thank heavens! I have to believe that DC has at least a few fishmongers. You just need to find them, that’s all. Cure salmon next? Really? I’d like to try my hand at making duck prosciutto this Winter. Let’s see how that goes before I take on another project. We try to eat a lot of fish in my home, but since my husband and I aren’t big mayo fans (crazy I know) there are a lot of sauces that we miss out on. So, I was really excited to read that your recipe for the dill sauce uses Greek yogurt. I’m really looking forward to trying your salmon and dill sauce out. Also, I’m from Chicago as well and I was wondering if you’d share your favorite fish mongers out to a fellow fan. Thanks! and you’ve got some amazing Italian recipes I’m looking forward to trying out. Although I’m not averse to using mayo or sour cream, for that matter, I like the tang that Greek yogurt offers. And it couldn’t be easier to prepare. I’ll gather the info for you and will be heading over to your blog. Thanks for dropping by and leaving a such a nice comment. Thank you so much, Kristy. I prepared salmon this way for dinner again tonight. It is just so easy and quick that if I see a nice piece of salmon, my dinner for that night is set. That pasta is a great dish, too. If you’ve never tried burrata, you’re in for a real treat. John, this is so funny. I just replied to your comment on my blog that I was just starting to think about the fish courses I will serve for Xmas Eve and then stopped here and see that you will be taking care of at least 3 for me!!! If I can just find a fishmonger here….it’s driving me crazy!! And now seeing your gorgeous salmon, I’m really jealous. I’m glad you posted a simple recipe as this because when making so many courses for the Eve, I like to NOT have overly complicated dishes to prepare. Plus, everyone will love this recipe!! I don’t know if the next 2 posts are going to be of much value to you, if you haven’t a good source for fish. As it is, I’m not even sure I can get the 2nd post’s “subject seafood,” and that’s why I’m keeping it secret. I’ve a back-up in case I can’t get/locate it. I love that crust on your salmon. It is done to perfection! I can’t wait to read more about the “Feast of the three or seven Fishes” Now I feel like the holidays have begun! Hi John, I love pan-seared salmon, especially the crispy skin! The dill sauce looks lovely, will definitely make it the next time I make my salmon. Have a great day ahead and take care! Thanks, Jasline. The beauty, for me, of this dish is in its simplicity. You would be hard-pressed to find a dish easier to prepare — and the same goes for the dill sauce. I hope you do make and enjoy it, Jasline. You, too, have a great week! I love salmon! This recipe looks mouth watering! John, growing up in Nova Scotia I was weaned on salmon. We had salmon everything from loaves to whole stuffed or poached salmon. This is such a beautiful dish. Makes me want to run to the store. We don’t have any fish markets in the area which is sad to me as I could live on the scaly delicacies. Ah well, I will pick some up when I’m in the Bay Area and cook it when I come home. Your recipe may be simple but inexperienced cooks need it. And I appreciated learning how to prepare salmon, a fish I had not eaten while growing up. Oh my gosh, sounds incredible! Love the addition of the dill sauce. Delicioso! This is how I usually prepare salmon, so quick and easy! I just need to find a way to stop the kitchen from stinking for days after! As for fresh fish, I’m lucky enough to always find a great variety at my local supermarket (including perch which I love). Thanks for sharing! As for the skin, there are 2 schools of thought — well, three if you take the fish’s opinion into account. It is a fact that the skin of salmon is where the omega-3 fatty acids are. It is also a fact that if the fish is from polluted waters, it is where contaminants — possibly mercury — can be found. If one eats plenty of salmon, it would be good to know where that salmon was caught. I treat the skin like I do tuna. I don’t think I eat enough of either to encounter any mercury-related problem. I hope this helps you and I’ll gladly ask any questions you may have. You’re very welcome, Sawsan. You’re not the first person to mention this and I’ll keep you all in mind with some future seafood recipes I’ve planned. You are quite skilled in the kitchen and won’t find any of them difficult to prepare. Just realized I bought two containers of dill weed (yes, I know that’s not “fresh”!). Two, oh what to do with two! Now I know. I have salmon, plain Greek yogurt, lemon and everything else required for this appealing dish. I hope you enjoy your salmon prepared this way. It’s very quick and uncomplicated. My favorite kind of dish.